Rugged reliability is guaranteed by the 12 inch D x 18 inch H Work Station and Counter Top Support Brackets by Best Bracket. Made of 1/8" steel, the support brackets exceed a weight load limit of 1,000 lbs., making these support brackets reliable and tough enough to face the heaviest storage loads. 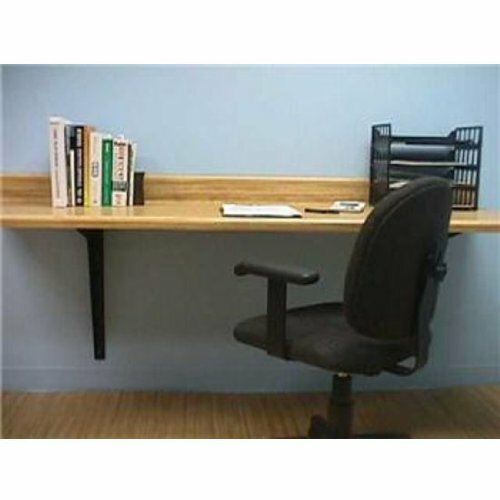 A reversible design and multiple mounting holes ensure that the brackets can be used to support most size counter and work station tops. A 3" x 3" 45° notch allows for wall cleats and concealed wire and cable runs, helping organize the work space. These brackets are available in full box quantities of 6 only, and come with equal quantities of right and left brackets per box. Four powder-coated color options are available, in addition the brackets can be ordered primed and ready-to-paint.